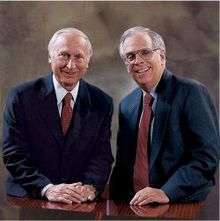 The company was founded by two MIT graduates, Ray Stata and Matthew Lorber in 1965. The same year, the company released its first product, the model 101 op amp, which was a hockey-puck sized module used in test and measurement equipment. In 1967, the company published the first issue of its technical magazine, Analog Dialogue. In 1969, Analog Devices filed an initial public offering and became a publicly traded company. Ten years later, the company was listed on the New York Stock Exchange. In 1973, the company was the first to launch laser trim wafers and the first CMOS digital-to-analog converter. By 1996, the company reported over $1 billion in company revenue. That same year, Jerald Fishman was named President and CEO, a position he held until his death in 2013 (see below). In 2000, ADI's sales grew by over 75% to $2.578 Billion and the company acquired five companies including BCO Technologies PLC, a manufacturer of thick film semiconductors, for $150 million. In January 2008, ON Semiconductor completed the acquisition of the CPU Voltage and PC Thermal Monitoring Business from ADI., for $184 million. By 2004, ADI had a customer base of 60,000 and its portfolio included over 10,000 products. In July 2016, Analog and Linear Technology agreed that Analog would acquire Linear in an approximately $14.8 billion cash and stock deal. 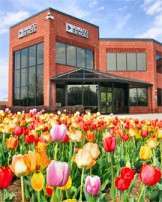 Analog Devices has fabrication plants located in the United States and in the Republic of Ireland. The company's testing facility is located in the Philippines. Design centers are located in Australia, Canada, China, England, Germany, India, Israel, Japan, Scotland, Spain and Taiwan. Raymond Stata is a founder of Analog Devices and was responsible for the business strategy and product roadmap. After founding the company in 1965, Stata served as the company's chairman of the board of directors since 1973, executive officer since 1996, CEO from 1973 to 1996 and president from 1971 to 1991. In addition, Stata is also a trustee of the Massachusetts Institute of Technology, his alma mater and was awarded the IEEE Founders medal in 2003. Stata received the EE Times "Lifetime Achievement" award in 2008. Stata served as the chairman of the Semiconductor Industry Association for the year 2011. Vincent Roche became President and CEO of Analog Devices in May 2013. He first joined the company in 1988 as a marketing director in Limerick, Ireland. Barrie Gilbert was named the first Technology Fellow of Analog Devices in 1979. In addition, Gilbert is an IEEE Life Fellow and holds over 65 patents. Gilbert is best known for the "Gilbert cell" – an electronic multiplying mixer. At Analog Devices, Gilbert started the company's Northwest Labs design center in Oregon and continued to work on RF products crafted with high-speed nonlinear circuit techniques. Paul Brokaw is an expert on integrated circuit design who has spent most of his career at Analog Devices, where he holds the position of Analog Fellow. Brokaw is the inventor of many analog IC circuits, including the Brokaw bandgap reference and holds over 100 patents. He is also an IEEE Life Fellow. Robert Adams is Technical Fellow and manager of audio development at Analog Devices Inc. Adams holds many patents related to the audio and electronic field. He is a member of the IEEE and a Fellow in the Audio Engineering Society. Adams received a finalist ranking for the EDN Innovation and Innovator of the Year award in 1995. Jerald G. Fishman was the CEO and president of Analog Devices from 1996 until his death in March 2013. In 2004, Fishman was named CEO of the Year by Electronic Business. He was a 35-year veteran of Analog Devices and also served on the board of directors of Analog Devices, Cognex Corporation and Xilinx. Analog Devices products include analog signal processing and digital signal processing technologies. These technologies include data converters, amplifiers, radio frequency (RF) technologies, embedded processors or digital signal processing (DSP) ICs, power management, and interface products. Data converters include analog-to-digital converters (ADCs) and digital-to-analog converters (DACs) that convert electrical signal representations of real-world analog phenomena, such as light, sound, waveforms, temperature, motion, and pressure into digital signals or data, and back again. Analog Devices ADC and DAC ICs are used in medical systems, scientific instrumentation, wireless and wired communications, radar, industrial process control, audio and video equipment, and other digital-processing-based systems, where an accurate signal conversion is critical. Data converters account for more than 50% of ADI's revenue. ADI's companion amplifier ICs provide accurate, high-speed and precise signals for driving data converters and are key for applications such as digital audio, current sensing, and precision instrumentation. The company's data converter chips are used by National Instruments in high-precision measurement instrumentation systems. Its data converters and amplifiers are also used by scientists and researchers in project "IceCube" – an underground telescope that uses digital optical modules (DOMS) to detect subatomic particles in the South Pole. Power management products for customers in the industrial, wireless infrastructure, and digital camera markets. These products support signal chain design requirements, such as dynamic range, transient performance, and reliability. Amplifiers includes precision and operational amplifiers, instrumentation, current sense, differential amplifiers, audio amplifiers, video amplifiers/buffers/filters, variable gain amplifiers, comparators, voltage, other specialty amplifiers and products for special linear functions. Analog Devices radio frequency integrated circuits (RFICs) address the RF signal chain and simplify RF system development. The company's RF portfolio includes TruPwr(tm) RMS power detectors and logarithmic amplifiers; PLL and DDS synthesizers; RF prescalers; variable gain amplifiers; ADC drivers, gain blocks, LNAs and other RF amplifiers. Analog Devices had a line of micro-electromechanical systems (MEMS) microphones until it sold that business to InvenSense in 2013. Analog Devices MEMS microphones were found in smart phones, tablet PCs, security systems, and medical applications. ADI's MEMS accelerometers were designed into game pad controllers by Microsoft, Logitech and Pellican. Analog Devices sells linear, mixed-signal, MEMS and digital signal processing technologies for medical imaging, patient monitoring, medical instrumentation and home healthcare. The company's precision signal-processing components and Blackfin digital signal processors are included in Karmelsonix's Wholter, an overnight pulmonary monitor, and the Wheezometer, a personal asthmatic assessment device. Accelerometers produced by Analog Devices are included in ZOLL Medical's PocketCPR, which measures the depth of chest compressions and provides audible and visual feedback to a rescuer to allow adjustment to proper depth and to the correct rate of compression. Analog Devices develops components for safety systems, such as stability control systems and driver assistance systems, infotainment and interior applications. Powertrain systems in hybrid and electric vehicles use high-precision data conversion products in battery monitoring and control systems. Analog Devices industrial market includes process control systems that help drive productivity, energy efficiency and reliability. Analog Devices has technology for consumer electronics, which includes signal processing circuits for image processing, auto focus, and image stabilization for digital still cameras and camcorders, audio and video processors for home theater systems, DVD recorders, and high-definition televisions and advanced touch screen controllers for portable media devices. In 2009, Databeans published its report on the top semiconductor analog suppliers. Analog Devices was named number two with other suppliers including: Texas Instruments, National Semiconductor (acquired by Texas Instruments in 2011), Maxim Integrated Products, Linear Technology. Other competitors include: Infineon Technologies, STMicroelectronics and Intersil Corporation . In 2011, Analog Devices was the third ranked analog semiconductor supplier. In 1967, Analog Devices first published Analog Dialogue. Dan Sheingold took the position of editor two years later, which he held for over four decades. The current editor is Scott Wayne. It is currently the longest-running in-house publication in the electronics industry. Analog Dialogue is a forum for the exchange of circuits, systems, and software for real-world signal processing and is the technical magazine published by Analog Devices. It discusses products, applications, technology, and techniques for analog, digital, and mixed-signal processing. Analog Dialogue is published monthly on the Web. The featured technical articles are also compiled in quarterly print editions. In 2009, Analog Devices announced EngineerZone, an online technical support community. EngineerZone was launched so the design engineering community (customers, prospects, partners, employees and students) can ask questions, share knowledge and search for answers to their questions in an open forum. Analog Devices circuits from the lab reference circuits are engineered and tested for quick system integration to help solve design challenges ranging from common to complex. Reference circuits are smaller, modular designs that are more broadly applicable than application-specific reference designs. Each reference circuit is documented with test data, theory of operation, and component selection decision criteria. In addition, reference circuits are tailored to meet real-world system integration needs and may also include board layout schematics, CAD tools models, device drivers, and evaluation hardware. 2000: BCO Technologies PLC, Signal Processing Associates, Integrated Micro Instruments Inc., Chiplogic Inc. and Staccato Systems Inc.
1 2 3 4 5 6 7 8 9 10 "ANALOG DEVICES INC 2014 Annual Report Form (10-K)" (XBRL). United States Securities and Exchange Commission. November 1, 2014. ↑ Hoovers. "Analog Devices, Inc.." Retrieved January 4, 2011. 1 2 Bloomberg. "ADI: Analog Devices Inc Summary." Retrieved January 30, 2011. ↑ Database. "." May 2012. ↑ Reuters. "Analog Devices, Inc.." Retrieved January 4, 2011. 1 2 3 Doris Kilbane, Electronic Design. "Ray Stata: Reaching Out To Third World Villagers Archived January 2, 2010, at the Wayback Machine.." October 20, 2003. Retrieved January 19, 2011. ↑ ECE lab. "Digital Signal Processors (DSP's) Archived November 22, 2010, at the Wayback Machine.." Retrieved January 30, 2011. ↑ Christoph Hammerschmidt, EE Times. "Analog Devices appoints Automotive group VP." October 30, 2009. Retrieved February 17, 2011. 1 2 Richard Wilson, Electronics Weekly. "50 years in electronics: Hall of Fame." October 1, 2010. Retrieved January 19, 2011. ↑ ADI Fact Sheet. "ADI FACT SHEET Archived March 14, 2011, at the Wayback Machine.." Retrieved January 19, 2011. ↑ TheFreeLibrary. "40 Years of Analog Dialogue.." Retrieved January 17, 2011. ↑ Computer History Museum. "Companies." Retrieved January 19, 2011. ↑ Juggle.com "Analog Devices Archived August 7, 2011, at the Wayback Machine.." Retrieved January 19, 2011. 1 2 3 Company Timeline. "ADI's interactive timeline." 2005. ↑ Company Fact Sheet. "ADI Fact Sheet Archived March 14, 2011, at the Wayback Machine.." Retrieved January 20, 2011. ↑ Reuters. "Analog Devices, Inc. (ADI): Jerald Fishman." Retrieved January 20, 2011. ↑ Romanelli, Alex (7 December 2000). "Analog Devices Acquires BCO For $150M". EDN. UBM Tech. Retrieved 24 April 2015. ↑ King, Alex Sherman sherman4949 Ed Hammond EdHammondNY Ian (26 July 2016). "Analog Devices to Buy Linear Technology for $14.8 Billion". Bloomberg.com. ↑ "Analog Devices to buy chipmaker peer Linear for $14.8 billion". Reuters. 27 July 2016. 1 2 Company About ADI. "Regional Headquarters." Retrieved January 30, 2011. 1 2 The MIT Tech. "Stata chosen as the 2010 commencement speaker." March 16, 2010. Retrieved January 19, 2011. 1 2 Forbes. "Ray Stata." Retrieved January 19, 2011. ↑ Tim Moran, EE Times. "EE Times fetes ACE award winners at ESC in San Jose." April 16, 2008. Retrieved January 30, 2011. ↑ Brian Fuller, EE Times. "Thunder in the valley." November 5, 2010. Retrieved January 30, 2011. ↑ Boston.com "Interim CEO Vincent Roche is appointed chief executive at Analog Devices." 1 2 Lucinda Mattera, Electronic Design. "Hall-Of-Famers Ponder The Future Of Electronics Engineering Archived April 4, 2011, at the Wayback Machine.." September 13, 2004. Retrieved January 19, 2011. ↑ Company press release. "BARRIE GILBERT ELECTED TO US NATIONAL ACADEMY OF ENGINEERING." March 31, 2009. Retrieved January 19, 2011. 1 2 Vanessa Knivett, EE Times. "ADLE's Top 10 analog engineers." January 5, 2009. Retrieved January 19, 2011. ↑ Microwaves & RF. "Microwave Legends Archived December 31, 2010, at the Wayback Machine.." Retrieved January 19, 2011. ↑ Vanessa Knivett, EE Times. "Some more top analog engineers." February 3, 2009. Retrieved January 30, 2011. ↑ Mary Duan, San Jose Business Journal. "IDT takes another shot at the Big Time after reorganization." August 5, 2010. Retrieved January 30, 2011. ↑ IEEE Fellow. "IEEE Fellow." Retrieved January 30, 2011. 1 2 Analog Devices. "Audio on the Move: When Microphones Convert, CODECs Compute, and Amplifiers Switch." Retrieved February 17, 2011. ↑ Jon Titus, ECN Magazine. "Audio ADCs Hit the High Notes Archived July 19, 2011, at the Wayback Machine.." March 18, 2009. Retrieved February 17, 2011. 1 2 EDN. "EDN's Innovation Competition: The Biggest Field Ever!." February 2, 1995. Retrieved February 17, 2011. ↑ EDN. "Asynchronous conversation thwarts incompatibility in sampling A/D systems Archived May 25, 2011, at the Wayback Machine.." July 21, 1994. Retrieved February 17, 2011. ↑ Boston Globe. "CEO Jerry Fishman Dies of Apparent Heart Attack." March 29, 2013. Retrieved March 31, 2013. 1 2 3 Reuters. "Analog Devices, Inc." Retrieved January 4, 2011. ↑ By Rick Nelson, EDN. "IC vendors seek green applications Archived June 29, 2011, at the Wayback Machine.." January 6, 2011. Retrieved January 6, 2011. ↑ By Pradeep Chakraborta. "Analog Devices leads global data conversion market." July 22, 2010. Retrieved January 20, 2011. ↑ bNET. "Analog Devices’ Current Sense Amplifier Achieves Industry's Highest Accuracy for Industrial and Automotive Applications." September 8, 2010. Retrieved January 5, 2011. ↑ By James DeTar, Investor's Business Daily. "EyeMario Lets Eyes Control Games; New Research To Be Unveiled Archived November 2, 2010, at the Wayback Machine.." October 29, 2010. Retrieved January 4, 2011. ↑ The Boston Globe. "Ice telescope uses Analog Devices components." June 30, 2010. Retrieved January 4, 2011. ↑ EE Times. "IceCube telescope: Extreme science meets extreme electronics." June 25, 2010. Retrieved February 2, 2010. ↑ By Peter Henry, EE Times. "Power Management: Designing from a System-level Perspective." August 30, 2010. Retrieved January 4, 2011. ↑ EDN. "Industrial CAN transceivers are fully isolated." October 25, 2010. Retrieved March 14, 2011. ↑ PowerPulse.Net. "Analog Devices Introduces Digital Isolator with Integrated Transformer Driver & PWM Controller." October 26, 2010. Retrieved March 14, 2011. ↑ DigiKey. "ADM3251E Line Driver/Receiver." Retrieved March 14, 2011. ↑ EDN. "The Hot 100 Electronic Products of 2009." December 15, 2009. Retrieved March 3, 2011. ↑ Richard Gawel, Electronic Design. "Instrumentation Amplifier Provides Industry-Best CMR In Half The Space." December 10, 2008. Retrieved March 3, 2011. ↑ DesignNew. "National Instruments Demonstrates ‘Eyes Only' Game Technology." February 7, 2011. Retrieved March 3, 2011. ↑ Paul Buckley, EE Times Europe. "Differential RF/IF amplifier claims best-in-class performance for driving high-speed data converters." June 8, 2011. Retrieved July 18, 2011. ↑ Louis E. Frenzel, MobileDesign.com. "5-GHz Differential Amp Solves The Drive Problem." June 15, 2010. Retrieved July 18, 2011. ↑ Janine Love, EE Times. "Free RF design tools aim to speed time to market." June 2, 2011. Retrieved July 15, 2011. ↑ Paul O'shea, EE Times. "Active receive mixer meets demanding wireless signal processing needs." April 7, 2004. Retrieved July 15, 2011. ↑ Paul Buckley, EE Times Europe. "New RF design tools simplify RF system development to speed time-to-market." June 1, 2011. Retrieved July 15, 2011. ↑ Anuradha Shukla, TMCnet. "ADI Introduces TruPwr RF Power Detector for 3G and 4G Mobile Terminals." June 15, 2010. Retrieved March 3, 2011. ↑ Janine Love, EE Times. "Variable gain amplifier takes aim at wireless infrastructure." January 16, 2006. Retrieved July 15, 2011. ↑ Ismini Scouras, EE Times. "Variable gain amplifier drives low impedances from one power supply." February 11, 2008. Retrieved July 15, 2011. ↑ Ismini Scouras, EE Times. "RF/IF variable-gain amplifier fits wireless infrastructure apps." February 1, 2006. Retrieved July 15, 2011. ↑ Compound Semiconductor. "Analog Devices Unveils Highly integrated SiGe BiCMOS and GaAs RF/IF Amplifier." September 28, 2010. Retrieved March 3, 2011. ↑ Colin Holland, EE Times. "Cost-conscious Blackfin packs in the processing power." September 14, 2010. Retrieved March 3, 2011. ↑ BDTi. "Analog Devices Introduces Lower-Cost SHARC Processors." April 21, 2010. Retrieved March 3, 2011. ↑ Embedded Insights. "Analog Devices: SigmaDSP." Retrieved March 3, 2011. ↑ Jeff Bier, EE Times. "A Survey of Mainstream DSP Processors." April 4, 2007. Retrieved July 15, 2011. ↑ By R Colin Johnson, EE Times. "Xsens, Analog Devices collaborate on 'Iron Man' MEMS sensors." May 19, 2010. Retrieved January 4, 2011. ↑ By Margery Conner, EDN. "MEMS sensor provides early detection of motor-bearing irregularities." May 7, 2008. Retrieved January 10, 2010. ↑ aVanessa Knivett, EE Times Asia/Analog Designline Europe. "MEMS accelerometers find place in CE." February 13, 2009. Retrieved February 3, 2011. ↑ BusinessWire. "Analog Devices Introduces Integrated Analog Front-End Subsystem for Diagnostic-Quality ECG Applications." February 8, 2011. Retrieved February 16, 2011. 1 2 Paul Errico, Electronic Products. "Enabling home healthcare Archived May 2, 2011, at the Wayback Machine.." August 2, 2010. Retrieved February 16, 2011. ↑ Shara Tibken, Fox Business. "Analog Devices Reports Strong 2Q, View; Lifts Dividend." Retrieved June 22, 2011. May 17, 2011. ↑ Paul Buckley, EE Times Europe. "Multichannel, 16-bit DAC drives productivity, energy efficiency and reliability in industrial process control I/O systems." Retrieved June 22, 2011. July 13, 2010. 1 2 BusinessWeek. "ANALOG DEVICES INC (ADI:New York)." Retrieved February 17, 2011. ↑ ICFull.com. "ADI three SigmaDSP audio processor for high-end TV." Retrieved December 1, 2010. 1 2 Dylan McGrath, EE Times. "[Dylan McGrath, EE Times Analog IC market to grow 15% in 2010, says firm]." March 2, 2010. Retrieved March 14, 2011. ↑ PC's Semiconductors Blog. "Analog IC market update from Databeans." ↑ Analog Devices. "Analog Dialogue: The best of Analog Dialogue, 1967-1991 Archived November 21, 2010, at the Wayback Machine.." Retrieved January 20, 2011. ↑ OPAMP History. "OPAMP History." Retrieved January 17, 2011. 1 2 Wayne, Scott (2013). Editor's Notes - A Tribute to Dan Sheingold (PDF). Analog Devices Inc. p. 2. 1 2 TheFreeLibrary. "40 Years of Analog Dialogue." Retrieved January 17, 2011. 1 2 Brian Fuller, Greenley's Ghost. "Analog Devices Gets More Digital." June 15, 2009. Retrieved January 30, 2011. ↑ Paul Buckley, EETimes Europe. "Reference circuit program targets a growing challenge facing design engineers worldwide." May 18, 2011. Retrieved June 24, 2011. 1 2 3 4 5 6 Company Timeline. "ADI's Interactive Timeline." 2005. 1 2 3 4 5 6 7 8 9 10 Alacra Store. "Analog Devices, Inc. Mergers and Acquisitions." Retrieved January 31, 2011. ↑ "Analog Devices to Acquire Hittite for $2 Billion". everything RF. Retrieved August 25, 2014.